PLEASE NOTE: This file needs Notebook Software in order to successfully open. In accordance with TPT policies I am not authorized to issue any refunds. This is a smartboard file. It is targeted toward a early elementary grade like 2nd, 3rd, or 4th. 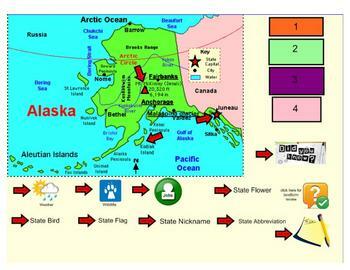 It presents basic information about the state of Alaska. The information includes: the capital, the geography and landforms of the state, the climate, the wildlife,the abbreviation, the state bird and flower, the state nickname,the cities, and other interesting facts. The file also includes a brief review of the kinds of landforms that are in the state. This file has some interactive slides and has directions.